Ecclesfield was recognised as a Ringing Centre by the Central Council of Church Bell Ringers in August 2009. The Centre is run in conjunction with St Mary's Ecclesfield Church Bell Ringers. The Centre is operated for the benefit of ringers in the South Yorkshire area. Ringers and those who wish to learn how to ring are welcome to attend our sessions. To teach bell handling and basic ringing skills to anyone who wants to learn to ring church bells. To mentor, coach and encourage those who ring church bells. 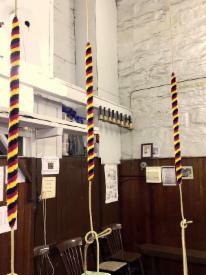 To hold regular Tower Open Days so that non-ringers can come and see what we do. To provide a good quality training environment and a centre for holding courses and events. To provide a 10 bell multibell simulator for use by visiting teams.